Visitors to the “Garden of Remembrance” are shown the former uses of this part of the inner harbour. The remains of post-war buildings are used as look-out towers or as stages for events. The transformation of the remains of the buildings into integral elements of the park is symbolised in particular by the planting of pine trees on towers and of locust trees in the floor space between the construction framework of theLudwigforum. Concrete walls made of white marble trace the old lines of the layout of the buildings and halls, providing a framework around the various areas. The past use of the areas is illustrated by various compositions of vegetation. The harbour’s function as a site for handling grain, as the “bread basket of the Ruhr area”, is symbolised by three fields planted with crops and sunflowers in front of the Ludwigforum. White waves of concrete form the borders of the grass waves in front of the harbour basin, inviting visitors to go in-line skating, ride BMX bikes or simply have fun, a use intended for them by Land Art artist Dani Karavan. Designed by Israeli architect Zvi Hecker in the form of a fan, the Jewish Community Centre opens out onto the park. The lines resulting from the slabs which form the walls are taken up again outside the building and continued down to the harbour basin in the form of a narrow channel. The main axis of the park consists of a patchwork of varying types of paving and materials used in the buildings which once stood here. Memories of the period when the harbour was in use are preserved. Trees are planted in an unusually few number of locations for a park and relate to the areas around them as solitary features or as groups. The shape, size and colour of the foliage were developed sculpturally from the spatial and functional context. The “debris sculpture” hill made of various materials from demolished buildings was created in a layering process as a special sculptural area in front of the senior citizens’ residence. A mixture of grasses and herbs has been planted here in advance of the natural greening which occurs through wild vegetation. At dusk, the “garden sculpture” is transformed into a successful light installation by light designers Belzner and Hofmann. The main architectonic elements of the parks are highlighted, making it a distinctive place. Anyone wanting to classify the works of Israeli artist Dani Karavan would find it difficult to define them as sculpture or Land Art. They cannot easily be assigned to the field of garden design either. Maybe his works are better described as “environment” (space for walking through), a form of design which integrates the surrounding area completely. Karavan’s works live from the interplay between form and material, light and shadow, stone and plant. His works of art are “living spaces” in the truest sense of the phrase. 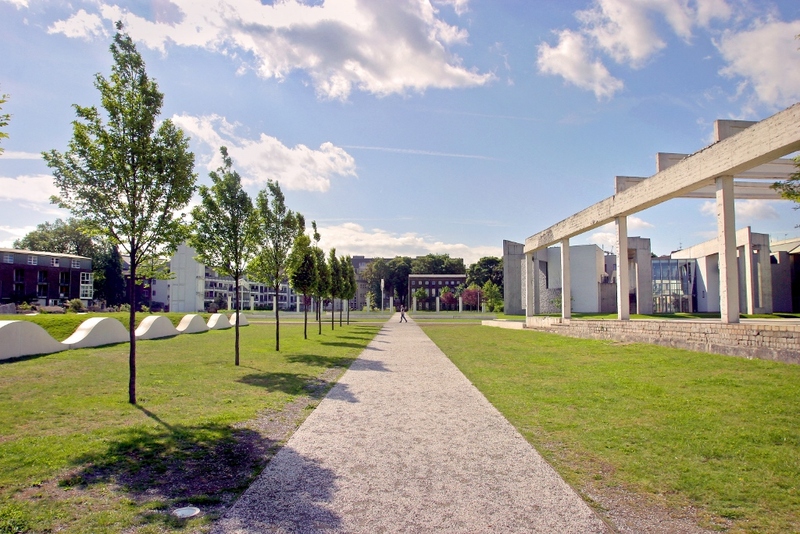 In 1998, the abandoned warehouses at Duisburg inner harbour provided the artist with an opportunity to compose a unique spatial environment consisting of natural elements such as earth and water, grass and trees along with the remains of buildings of the former harbour. All the shapes and lines of the new park are based on the original plan of the old harbour quarter. For example, white strips of marble concrete trace the old lines of the layout, simultaneously forming a wall for sitting upon. They shape the structure of the whole park and form the framework for various compositions of vegetation. The remains of post-war buildings are used as look-out towers or included in the planning of vegetation for the park. The singular transformation of the remains of buildings into integral elements of the park becomes particularly clear when one sees the pine trees planted on the towers and the locust trees on the raised floor of a former despatch building (“Ludwigforum”), evoking associations with the mediaeval “Torre Guinigi” tower in Lucca in Tuscany. Trees are planted in an unusually few number of locations for a park and relate to the areas around them as solitary features or as groups. The shape, size and colour of the foliage were developed sculpturally from the spatial and functional context. When the trees were being selected, the criteria of habitus, blossom, autumn colouring and winter appearance were of primary importance. The smaller areas are divided up by the white walls. Here, very different compositions of vegetation have been created by deliberately sowing one type of plant or by changes in the substrate. Various types of gravel lawn and scrub lawn or ruderal meadows with tall forbs form a strong contrast to the trimmed park lawns throughout the course of the year (Vegetation planning: DANIELZIK + LEUCHTER). Pieces of debris have been placed in a large triangular space in such a way that they can be interpreted both as sculptures and as locations for ruderal vegetation. A “rock garden” which illustrates beautifully the fusion between the remains of buildings and wild vegetation has evolved here as a result of the spontaneous growth of vegetation along with the selective removal of certain plants (thistles, knotweed, nettles) and the deliberate planting of others (whitethorn, wild roses, sloes). The main axis of the park consists of a patchwork of various types of paving material– the remains of the buildings which once stood here. Memories of the period when the harbour was in use are preserved. Bulbs have been planted in differentiated patterns in some selected areas, resulting in a special display of flowers in spring. Duisburg’s inner harbour was once referred to as the “bread basket of the Ruhr area” due to the enormous quantity of grain handled here and the largest milling industry in western Germany flourished here in 1900. The rapidly growing population of the Ruhr area required a secure supply of grain, which was transported along the waterways to Duisburg from all over the world. In 1925, there were 115 flour mills in the inner and outer harbours, handling up to 1 million tonnes of grain. The historical significance of the inner harbour gave rise to the idea of the “three fields”. Cereals, sunflowers or various other crops are planted in rotation in three neighbouring fields during the course of the year, resulting in changing vegetation of great symbolic power. Duisburg’s inner harbour has now developed into a place for working, living and cultural activity. Old storehouses and mill buildings along the harbour basin have been converted into offices, restaurants and cafés. The Küppersmühle and Wehrhahnmühle are popular museums. A gallery with an “art display window” opening out onto the park has become established in the renovated buildings in the “Garden of Memories”. Composers Gerhard Stäbler and Kunsu Shim live in the second half of the building and frequently use the outside area in the course of their experimental musical performances. Designed by Israeli architect Zvi Hecker in the form of a fan which is also reminiscent of an open book or an open hand, the Jewish Community Centre opens out onto the park. The lines resulting from the slabs which form the walls are taken up again in the design of the outside area and continued down to the harbour basin in the form of narrow channels. 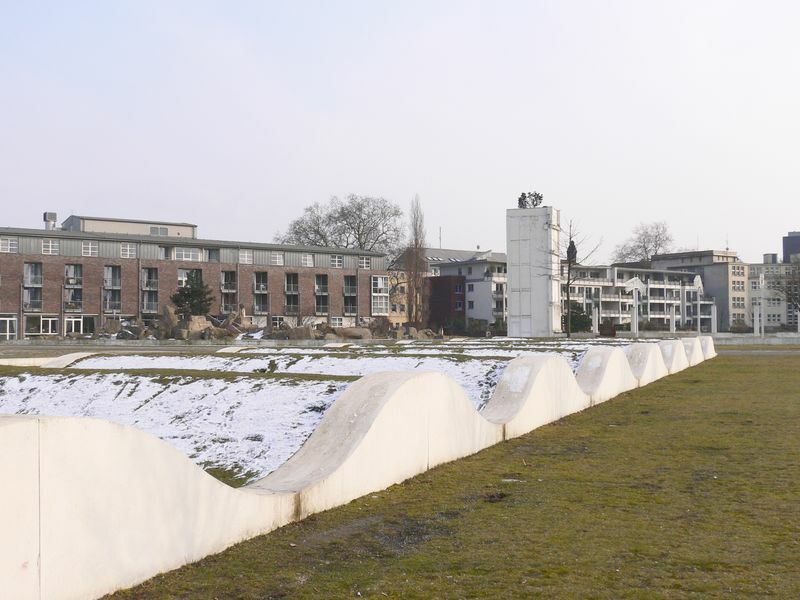 The Jewish community of Duisburg – Mülheim – Oberhausen – has found a new home in a prominent location here, not far from Junkernstraße, the site of the synagogue which was destroyed in 1938. An “arch bridge” designed by “bridge artist” Professor Jörg Schlaich of Stuttgart (Schlaich, Bergermann and Partner sbp gmbh) bridges the harbour basin in a northern direction from Izahak Rabin Square at the western end of the park. The bridge is raised to the height necessary for ships to pass underneath it by being pulled into the shape of a “cat’s arch” using steel pylons. When the traction ropes are taut, the walkway is raised by approx. 8 meters compared to its normal height above the harbour basin. At dusk, the “Garden of Memories” is transformed into a successful light installation by light designers Belzner and Hofmann. The main vertical elements of the park are particularly highlighted, making it a distinctive place at night.